What is the Pathway to Violence? The conscious decision to kill or physically harm specific or symbolic victims in a workplace or on a campus is now categorized as targeted or intended violence. In contrast to affective or impulsive violence, targeted violence is by definition planned, emotionless, and predatory. Systematic research and extensive case experience by ourselves and others has demonstrated the central notion of a targeted “pathway to violence”, and its significance for workplace and campus violence risk assessment. Homicidal violence of this nature is rooted in deeply felt personal grievances, usually fed by an accumulation of work or career-related and personal losses, chronic anger, and/or driven by delusional or paranoid states of mind. Seeking revenge or notoriety in this way, perpetrators of targeted violence invariably traverse the pathway to violence, progressing along identifiable steps. Such movement is often revealed to others, as it is not uncommon for the individual contemplating violence to communicate his or her feelings and intentions in some form to third parties, such as co-workers and friends, and less often directly to a target. Preparatory actions – for example procuring and practicing with the firearms or weapons for an attack – may be detected. 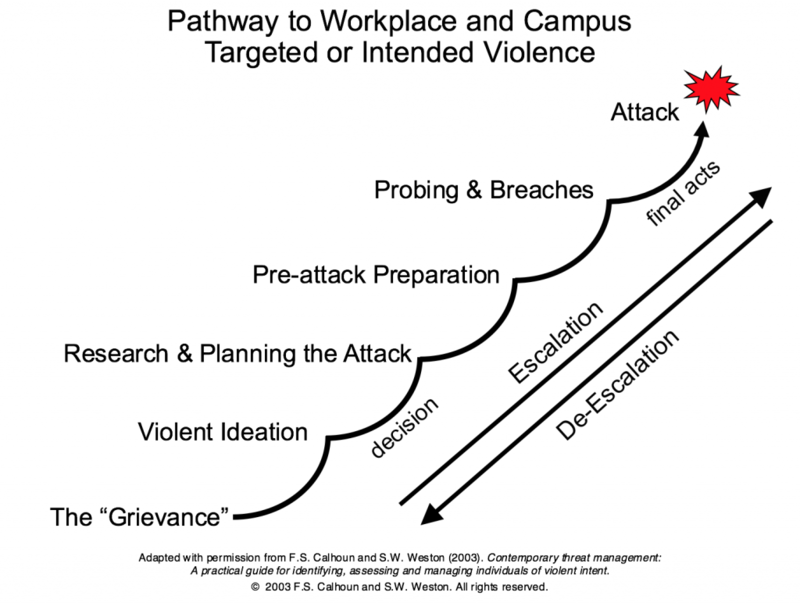 The items of the WAVR-21 reflect the static and dynamic risk factors known to be associated with workplace and campus targeted or intended violence, with its emphasis on this concept of an escalating pathway. The item domains include psychological, behavioral, historical, and situational factors associated with workplace and campus violence, including intimate partner violence posing a threat to any organizational setting. In practice, threat assessment and threat management are intertwined. Dynamic risk factors become the focus of ongoing interventions intended to reduce risk. Assessment and monitoring are ongoing, and an individual’s response to various interventions (e.g., escalation, de-escalation, or no apparent change) become part of the evolving opinion of risk level. WAVR Authors & WTS publish a periodic electronic newsletter with succinct feature articles on violence risk topics, upcoming training and news. WAVR-21 is a registered trademark. © 2007 Stephen G. White & J. Reid Meloy.